Competition full synthetic transmission oil. 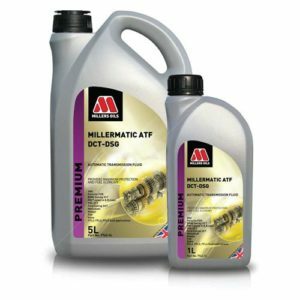 A blend of full synthetic base oils incorporating new “Nano Technology” additive chemistry to significantly reduce internal frictional and power losses. 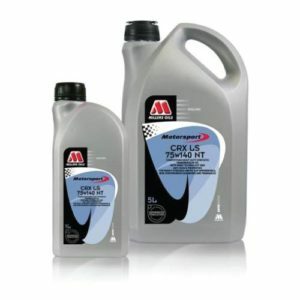 This is a competition grade transmission oil and formulated using a unique combination of improved chemistry and lower friction NANODRIVE additives to massively reduce friction vs. a standard oil. Note: Does not contain friction modifiers. For plate-type Limited Slip differentials use CRX LS 75w90 NT. 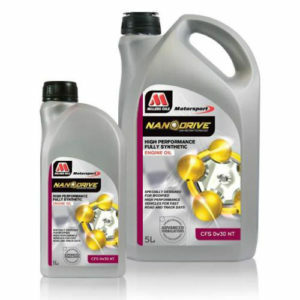 APPLICATION:Designed for the lubrication of competition gearboxes. Manual transmissions, synchromesh, non-synchromesh, sequential gearboxes, transfer gearboxes, transaxles and hypoid differentials without limited slip which require API GL4 or GL5 performance. 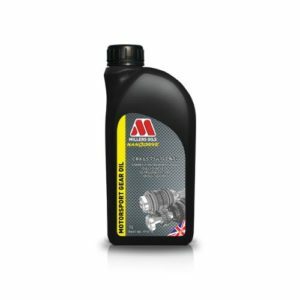 Recommended for modern transmissions where full synthetic oil is specified, especially for high performance road and track day applications. Hewland, Xtrac, Glebe Transmissions, ZF, Tran X, Elite Transmissions. • Laboratory tests and results show a further 15% reduction in friction and a further 17% reduction in wear over the previous award winning NT range• Exceptional cold flow properties for easier gear changes. • Fast lubrication flow to component extremes on start up. • High film strength for maximum component protection. • Significantly reduces friction, temperature, wear and minimizes power loss.